Occasionally virga. Mey form ahead o a frontal sestem, especially thegither wi other cirriform cloods meanin rain in aroond 10 oors. 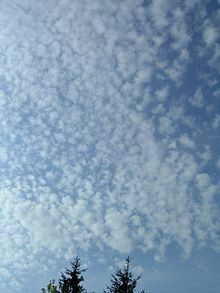 Cirrocumulus is ane o the three main genus-teeps o heich-altitude tropospheric cloods, the ither twa bein cirrus an cirrostratus. ↑ 2.0 2.1 "Cirrocumulus Clouds" (PDF). Cloud Microphysics Webpage. Georgia Institute of Technology. Retrieved 6 February 2011. ↑ Funk, Ted. "Cloud Classifications and Characteristics" (PDF). The Science Corner. NOAA. Retrieved 6 February 2011. This page wis last eeditit on 27 August 2015, at 18:53.